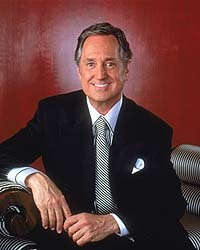 It is hard to imagine the history of rock and roll without the many contributions of Neil Sedaka. For over four decades, Sedaka's timeless standards have helped change the face of popular music. With countless hit singles, and platinum and gold records, he is recognized as one of rock and pop music's legendary pioneers, and remains as vital a force today as he was when he first achieved his string of hits back in the late 1950's. He began performing on the piano as a youth and played on a classical music radio station, as well as studying at Juilliard. He also began experimenting with doo wop and rock and roll, singing and playing in an early version of The Tokens. His composition "Stupid Cupid" was a 1958 success for Connie Francis and Sedaka was signed to RCA Records as a solo performer. A string of hits followed. The best-known Billboard Hot 100 hits of his early career are "Oh! Carol" (#9, 1959), "Calendar Girl" (#4, 1960), "Happy Birthday Sweet Sixteen" (#6, 1961), and "Breaking Up Is Hard to Do" (#1, 1962). "Oh! Carol" references Sedaka's Brill Building compatriot and former girlfriend Carole King. King soon responded with her own answer song, "Oh, Neil," which directly references his song (and his full name). A Scopitone exists for "Calendar Girl". In 1973, Sedaka began working in England with Elton John, who signed him to his Rocket Records label. 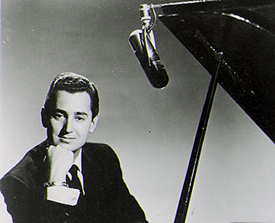 Following a decade-long fallow period, Sedaka returned to the public's attention with a flourish, topping the charts twice "Laughter in the Rain" and "Bad Blood" (both 1975). 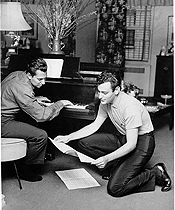 Sedaka and Greenfield also co-wrote "Love Will Keep Us Together", a No. 1 hit for The Captain and Tennille and the best selling record of 1975. 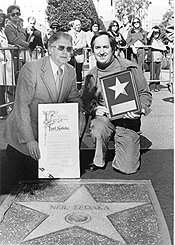 Sedaka is also the composer of the popular "Is This The Way to Amarillo", a song he wrote for Britain's Tony Christie. It reached #18 on the UK charts in 1971, but hit #1 when reissued in 2005, thanks to an amusing cameo-filled video starring comedian Peter Kay. Sedaka recorded the song himself in 1977, when it became a #44 hit. 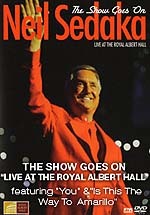 On April 7, 2006, during a concert at the Royal Albert Hall in London, Neil Sedaka was presented with an award from the book Guinness World Records: British Hit Singles and Albums as the writer of the Best-Selling Single of the 21st century for "Amarillo". In 2006, Sedaka continues to perform regularly. He has a star on the Hollywood Walk of Fame and was inducted into the Long Island Music Hall of Fame in October 2006. In 1975 you also helped to launch the career of the Captain and Tennille with their version of your 'Love Will Keep Us Together.' When the dust had settled did it ever cross your mind that perhaps you should have kept that song for yourself based on its phenomenal success?! “Oh, we’re jumping quite a bit here,” he gently laughs. ”I had ten Top 10 records in a row between 1958 and 1963. I sold about 40 million records worldwide. Then there was a lull between ’63 and ’74, but I met Elton John – who was starting a record company – and he signed me to his Rocket Records. I then had an album called Sedaka’s Back which was a remarkable comeback for me. I was then back at the top of the charts with a song called ‘Laughter In The Rain'." Where could we find that Grammy today? Somewhere safe? ”Oh, I have one and the Captain and Tennille have one. Mine is on my mantel alongside my gold records right here on my wall,” he says proudly. What is your favorite moment of this Royal Albert Hall event for our readers to watch out for? ”Well, I did do a duet with Tony Christie on ‘Is This The Way To Amarillo.’ That was very exciting. I actually also got an award that night. The Guinness World Book of Records came out during the concert and they gave me an award for the top selling record of the 21st Century in the UK." Having first achieved your hits back in the late 1950's, how does recording and performing songs today match up to those days? ”Well, today you have so much more freedom. In those days we had to record three singles in four hours. Today, you go in, you put down a piano track or a rhythm track and then the next day you’ll add some horns, the following day some strings. You have much more leisure time. Plus, in those days I had to do something that was ultra, ultra, ultra commercial. Now, after 50 years I’m recording things that are close to my heart; things that are meaningful to me whether they are commercial hits or not."